MedLine MediGuard Vinyl Synthetic Exam Gloves are an economic choice that is perfect for general patient care. MediGuard Vinyl gloves are designed with high-quality that gives them improved tactile sensitivity. These gloves are highly durable and meet the requirements of the DINP and California Proposition 65. 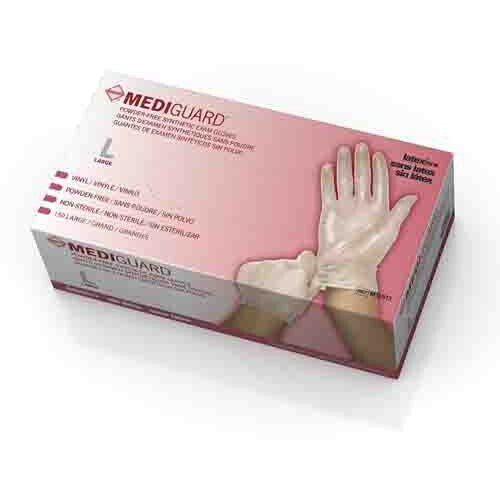 MedLine MediGuard Synthetic Exam Gloves are made of smooth, clear vinyl and feature a beaded cuff. They have a finger thickness of 5.9 mil and a palm thickness of 4.7 mil. They are powder-free, non-sterile, and measure 9 inches in length. They are available in 4 sizes (small, medium, large, x-large) and can be purchased by the box or case. Vitality Medical also offers latex exam gloves and nitrile exam gloves at discounted prices and with fast shipping. Product was used for me in a skilled nursing facility, and I am providing it to my caregivers in four sizes. They have no complaints about the product, which they sometimes need to use on a double glove task. Free delivery to Sunnyvale, California of a box of 1500 gloves on December 12, that was ordered on December 10 was very good. This brand of gloves were used on me by CNAs and Nurses at the skilled nursing facility I was at for many months before returning to my home, where my caregivers are using the gloves on a daily basis. Delivery time for them from Vitality Medical, using the free shipping option, has been very good , with one exception, where part of one order was sitting in the bowels of Texas for several days because of the peculiar labeling requirements imposed by the State of California on the packaging of this product. these are non sterile, great for use to care for elderly and around the house in general. Good price and delivered quickly. I've used these latex free vinyl gloves for several years. They have always served me well. I would highly recommend them. Good quality at a fair price. Will order again when needed.